If you’re feeling self-conscious or afraid to smile because you have missing teeth, or if you wear uncomfortable and ill-fitting dentures, call Creedmoor Family Dentistry and see if dental implants would work for you. Dental implants are considered the standard of care for replacing lost teeth, not only as a long-term restoration, but also for blending in with your natural teeth. A dental implants is a post made of titanium, a bio-compatible metal, which is placed into the jawbone and left to fuse with it. The posts are then covered with crowns, which can be made of ceramic or porcelain, shaped and colored to give you an aesthetically pleasing smile. To learn more about dental implants, please call our Creedmore dental office today and request an implant consultation with Dr. Willis. You have healthy gums and enough bone in the jaw to secure the implants. You are committed to good oral hygiene and twice-yearly dental visits. If you smoke, have chronic conditions such as diabetes or heart disease, or are undergoing chemotherapy to the head and neck, Dr. Willis will perform an evaluation and discuss whether dental implants are right for you. If you have gum disease, it will be treated before the implants are placed by your oral surgeon. If you do not have enough jawbone, Dr. Willis will discuss options with your oral surgeon about building up the bone, such as bone grafts. ﻿For implant treatment, Dr. Willis works with a team of oral surgeon specialists, and he will discuss the procedure with your oral surgeon before performing the restorations. Your oral surgeon will do a comprehensive examination, including taking x-rays of your teeth and gums. During the surgery, your oral surgeon will place the implants into your jawbone. As the bone around the implants heals and fuses to the post, you will likely be on a diet of soft foods, cold foods, and warm soup. The healing process can take up to several months. 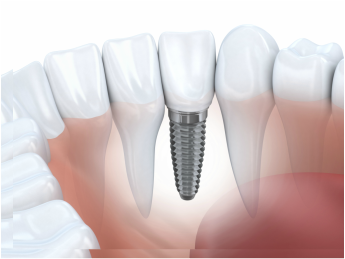 Once the implants have integrated with the bone, you’ll return to your oral surgeon for a second surgery. Your surgeon will confirm if the implant is ready for surgery by taking an x-ray. If it is ready, the implant will be exposed and a healing cap will be placed on its head. The healing cap helps the gum tissue to heal correctly. It stays in place for 10 to 14 days. After that, the cap is removed, an abutment is screwed into the implant, and a final impression is made of the abutment for each tooth. At your appointment with Dr. Willis, he will create a dental crown for your implant. It will be based on the size, shape, color, and fit of your old tooth, based on the x-rays taken earlier. If you have more than one implant, Dr. Willis will have a custom-made bridge created for you and fit you with a temporary crown or bridge until it is ready. The temporary crown is made of softer material than the permanent one to help you get used to chewing, biting, and talking while still protecting your mouth. This can take several weeks to complete. When you have your permanent crowns placed, be certain to make an appointment to see Dr. Willis in six months’ time.